Update: Missed it by that much. If in the future, you are planning to shop at the new Sprouts, don’t head into the old fresh & easy location, because it won’t be there. Head slightly to the left, into the old Office Max spot next door, which shares the same address. Thanks to reader Diane who emailed us and gave us the info. Thanks to tipster Carl who let us know that the Foothill Boulevard fresh & easy in Upland that was one of the dozens of stores that closed back in September is being fashioned into a Sprouts Farmers Market. The future Sprouts is at 829 W. Foothill Blvd. 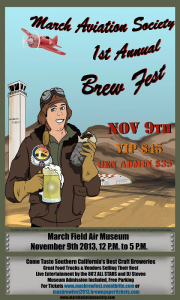 Attendees will be able to sample from more than a dozen Inland Empire breweries (and a few others) at the event. In case you missed it, downtown Upland has lost one restaurant, is losing another, but is gaining a third. Already closed is Aria Restaurant and Lounge, which was owned by the same folks who own Antonino’s Italian Restaurant, Haandi Indian Cuisine, Sixty 6 Sports Bar and Lounge and the Magic Lamp Inn in Rancho Cucamonga. Facebook fan Diana reports that Charlie’s Red, White and Blue American Deli and Bar is moving into the space at 296 N. Second Ave. Although San Bernardino County lifted the ban on hot food trucks (sorta) over two years ago, there are still just a couple of local trucks registered with the county. And the trucks don’t really operate on a daily basis as they do in Los Angeles and Orange counties. And the only semi-regular stops for the trucks are at county breweries, typically on Friday nights. And then there’s Cal State University San Bernardino. 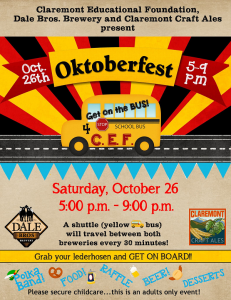 It’s two, two, two festivals in one as Claremont Craft Ales and Upland’s Dale Bros. Brewery team up for Oktoberfest this Saturday. The event will take place from 5 to 9 p.m. Saturday (October 26). Those of you who have been craving orange chicken burritos, chorizo wontons and carne asada fried rice can rejoice! Ontario’s Dragon Loco Chinese-Mexican fusion restaurant is scheduled to reopen at 11 a.m. Friday (October 25). The restaurant closed earlier this year after getting flooded, and the owners subsequently remodeled the location. Food trucks will be returning to downtown Riverside in another food truck rally tomorrow (October 22). 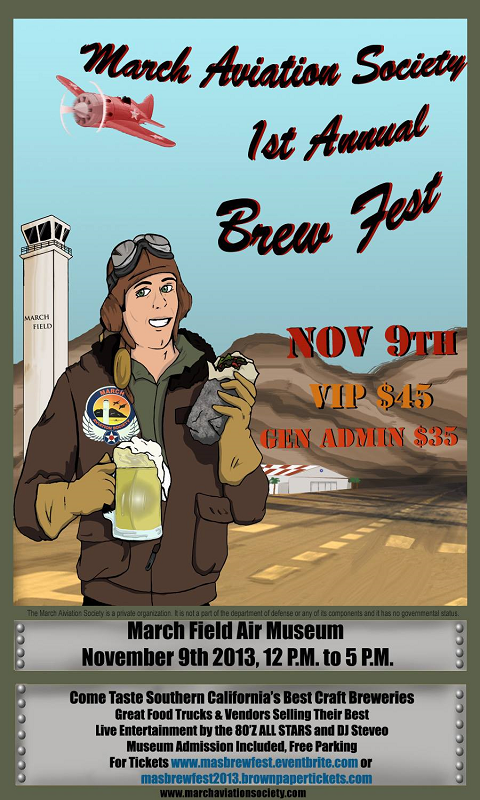 The event will again take place in the parking lot of the County Administration Center, 4080 Lemon St. It will run from 8 a.m. to 2 p.m., though some trucks won’t be available ’til 10 a.m.
Organizers have scheduled 20 trucks, compared to about a dozen trucks recruited for the original (well-attended) rally back in June. The event coincides with the county’s Board of Supervisors meeting. The county is investigating changing Ordinance No. 580, which pertains to food trucks, which bans most hot food trucks. Riverside County is currently the only county in the state which bans the trucks from operating on a daily basis. 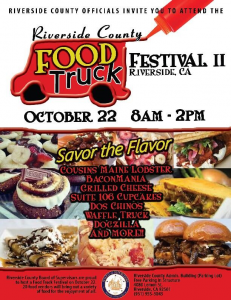 The University of Redlands will celebrate its Homecoming today with, among other things…food trucks! Four trucks (Me So Hungry, Eat ‘Em Up Truck, Krave Fusion and Mustache Mike’s Italian Ice) are scheduled to serve from noon to 3 p.m. in the Grass Quad, 1200 E. Colton Ave., Redlands. The trucks will be open to the general public.